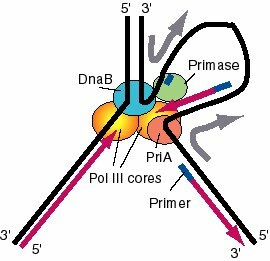 It is plausible that the multisubunit primosome is associated with the DNA polymerase III holocomplex in an even larger complex called a replisome at the replication fork. DnaB and PriA are the primary helicases in replication, and thus the proteins in the primosome may also be functioning to unwind and move DNA strands at the replication fork. DnaB-directed movement of the primosome in the 5' to 3' direction along the template for lagging strand synthesis corresponds to the direction of replication fork movement (Figure 5.26). In contrast, movement directed by PriA would be in the opposite direction. These opposite activities can be accommodated in a "sewing machine" model for the replication fork, in which the replisome is postulated to be stationary (the sewing machine) and the DNA being copied is moved through it, much like moving cloth through a sewing machine. If DnaB is at the front end of the replisome, it can unwind the parental duplex DNA and pull the template for lagging strand synthesis into a loop (Figure 5.26). The DNA tracking activity of PriA, if positioned at the back of the replisome, would pull the template for lagging strand synthesis in the opposite direction, enlarging the loop. Priming and elongation of Okazaki fragments can take place in this loop. Figure 5.26.A model for the activities of helicases DnaB and PriA at replication fork. In this model, the replication machinery in a large replisome (polymerase and primosome) is postulated to be stationary, with the DNA strands moving through it like fabric through a sewing machine. After unwinding the duplex DNA at the replication fork, the DnaB helicase can also track along single stranded DNA in a 5' to 3' direction. If the helicase is stationary, then the template strand for lagging strand synthesis moves in the direction of the upper gray arrow in the diagram, away from the replication fork. This template strand is also bound to the PriA helicase at the "back" end of the replisome. The 3' to 5' tracking activity of PriA will also pull the template strand, now in the direction of the bottom gray arrow. The result of the DnaB and PriA tracking activities is to pull the template for lagging strand synthesis into a loop, which is tethered to the replisome at both ends. Primase is also in the replisome, and can synthesize primers along this strand at appropriate intervals (thick blue lines), and one of the core polymerases of the DNA polymerase III holoenzyme can synthesize an Okazaki fragment. Newly synthesized DNA is a thick violet line, and parental DNA strands are thick black lines.